It's 1983. Arch-conservative Prime Minister Margaret Thatcher is at 10 Downing Street. The UK has just recently emerged victorious from the brief Falklands War, in which a few hundred British troops died. And in the poorer and more working-class districts of England, gangs of skinheads roam the streets, albeit not with the connotations that term carries now...not yet anyway. 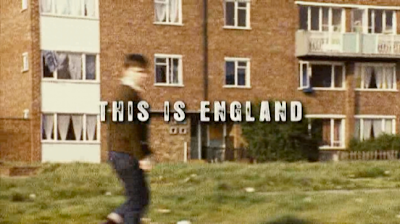 Director Shane Meadows firmly places his story within this historical context, in an opening montage which combines images of 80s pop culture with documentary footage of political occasions and social unrest. Then he segues into the main narrative, a coming-of-age tale centered around Shaun (Thomas Turgoose), a 12-year-old whose father has died in the Falklands War. The boy misses his dad, is mercilessly teased, and seems vaguely lost until he is adopted into a good-natured gang of older skinheads. These skins are a multiracial, goofy, fun-loving bunch and as Shaun marches through the wreckage of working-class England with them to the beat of reggae, he seems to have found his identity. At this point the movie is engaging and fun but seems relatively minor - yet another 00s nostalgia trip. The full force of its narrative, and the recognition of the aching pain behind Shaun's adolescent confusion and the underclass restlessness onscreen, comes bursting into the film with the appearance of Combo (Stephen Graham), an older member of the gang just out of prison. Nominal leader Woody (Joe Gilgun), who amiably brought Shaun under his wing, begins to lose his influence over the boy and really, it's no wonder. For one thing, Woody seems completely cowed by Combo's presence; when Combo shares a racially offensive prison story with his buddies, humiliating the one black skin Milky (Andrew Shin), Woody fumes but says nothing. Woody eventually drifts away from the group, taking his girlfriend and several of the more peaceful skinheads with him, but others remain behind...including Shaun. Combo becomes something of an older brother/mentor figure to the boy, expressing his latent hostility and buried hurt with a litany of vitriol aimed at multiple targets, including Thatcher and her "phoney war," but also immigrants and racial minorities - despite his claim that he's not racist. Shaun falls under the spell of these more militant skins, helps rob and beat up a Pakistani, and proudly displays the St. George's Cross after nicking it from a National Front meeting. Meadows clearly indicates his disapproval of the crypto-fascism on display, closely documenting the schisms and discomfort growing within the group, and scoring the montages with mournful music, lamenting the hardening of young Shaun's heart. But the writer/director doesn't make the mistake of disguising Combo's appeal. As played by Graham, Combo is as charismatic as he is intimidating, and we never lose sight of the genuine pain beneath his furious exterior. His early conversation with Shaun conveys a far deeper understanding of Shaun's malaise than the genial Woody could summon; even when the gang attacks the Pakistani shop, we remember how the shopowner was rude to Shaun early in the film - and thus how the confused boy could see him as another nasty elite rather than a frightened outsider in a hostile community. So the film grows from an enjoyable if slight nostalgic piece to a more resonant, more conflicted portrait of unease and discontent as it approaches its climax. Following a scene which exposes, and lacerates, Combo's softer side, we reach the heart of the movie, in which Combo tentatively invites black skinhead Milky over for a smoke. This sequence is a small masterpiece, not only capturing the full gamut of the stoned experience from fraternity to paranoia, but conveying the essence of Combo's desire for companionship and suspicion of the rest of the world in one fell swoop. It's as powerful as is focused, and demonstrates how perfectly Meadow has captured not just a moment but a mindset by zeroing in on a particular. This is England's story is actually rather small-scale - there is never any rendezvous with a big historical event, not even a riot or demonstration, and the payoff to the narrative unfolds on a very personal level. Yet the film, with its opening montage and its casual references, but most of all with the burning intensity of its focus, has the latent feel of an epic. It's quite an achievement, and a very worthy film.